Last year at NAMM, Eastwood grand poobah Mike Robinson and I were talking about hot rods and custom jobs. He’d said one of the truly fun things he dug about motorcycle riding was tripping out your bike with custom touches that made it your own. This led into talk about custom guitars and some of his favorite custom shots people had sent in to him with their modified Eastwood’s and Airline’s. 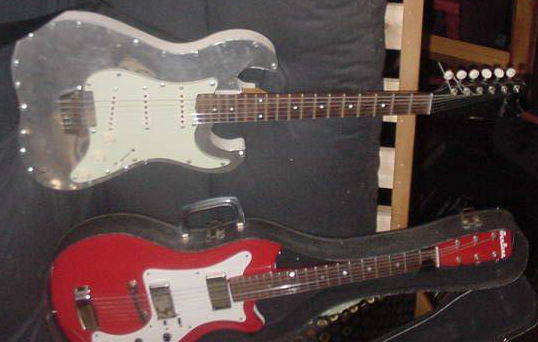 He sent me a couple of cool pictures at one point of wild things people had done to their guitars, and it got me thinking about a long-neglected project of mine with an old Silvertone/Danelectro. Most of the mods I do are on amps—and they tend to be unseen, unless you look under the hood—but here was a guitar job that would be obvious to anyone who saw it. While I spend most of the time in this column writing about very cool pieces that came as they are from budget factories in the 60’s, sometimes a piece begs for modification. Sometimes (adding a Bigsby on anything I can, for instance), the mod is minimal and reversible. Sometimes, a beat up guitar or amp shows up begging for more than a simple mod and they become a kind of Frankenstein’s Monster. Case in point: this Silvertone (Danelectro-made) 1448 (i.e., the one pickup “Amp in Case” guitar). One good neck—with Brazilian rosewood we can’t get anymore. Odd to see on such a low rent “cheap” guitar. But Danelectro necks were incredibly study and stayed very straight—which is good, since they didn’t have truss rods, after all. And, it may seem minor, but Dano’s aluminum nut contributes to the tone and is a very cool part. One set of tuners. The Dano/Silvertone open back key tuners are not the best ever made but they actually hold tune of the guitar is set up well. Original Dano bridge, with the “semi” (emphasis on semi) adjustable rosewood slab for intonation. Or something kinda close to intonation. 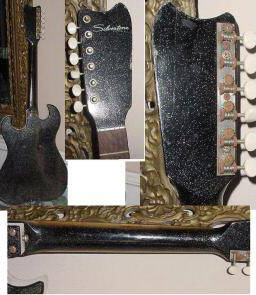 The back of the original guitar and the pieces of wood that all hardware would/could anchor in to. I’m no expert on Danelectros, but the wood used in the Amp-in-Case models (the hollow ones, at any rate, before the solid wood versions of 67 and 68, after the MCA takeover) is usually quoted as pine or poplar. In any case, there’s not much wood in there—enough to anchor a bridge and to hold down the Masonite top. So what did I need? Electronics and a new top. I had the cracked and beaten old Masonite top, so I used it as a template to cut a new top. My options were to restore it and find some old Danelectro pickup, if I wanted to keep it original. OR, I could add two lipsticks and make it a custom job, while retaining the materials of the originals. Or, the option I went with, I could make it a total one-off custom job. A buddy of mine owns a custom car shop and he was headed to a junkyard and then a metal yard and asked if I wanted to come along. Figuring a day at a junkyard and a sheet metal shop were more fun than a day of working on a book, I jumped at the chance. Along with a bunch of crap I probably didn’t need, I left the yard that day with a nice sheet of brushed aluminum. I used the old, broken top as a template and cut the meal the shape of the top of the guitar. Then I ground down the sides, so no metal would come sharp off the edges. On the old Danelectro body, there was about a ¼ inch of wood—perfect for mounting the new metal top with some sheet metal screws, which gave it a cool (to me, at least) industrial look. Now for electronics. The first version had some top-mounted old DeArmond Silverfoils off an old Harmony that was broken beyond repair. These sounded ok, but the look wasn’t quite right. So, next, I took off the metal top and cut out its center and mounted a modified after-market loaded Stratocaster pick guard. This took some trimming of the pick guard so it would fit the top properly but, once it did, it looked pretty snazzy. The meal also offered some of the best shielding I’ve EVER heard on a Strat-style guitar. The single coils sounded great with almost no single coil hum or buzz—not even when standing under neon sage lights. Go figure. And the best thing? Something odd happened when I put the Strat electronics onto the Dano body and neck: the tone became a strange hybrid of both guitars. It sounded sort of like a Strat, but the short scale neck, along with the odd bridge and aluminum nut and (probably the biggest factor) the hollowed-out body made it sound different than any Strat I’d ever heard. It had the twangy jangle and snap of a Dano, but higher output on the pickups. A very cool combo—all for under $100 in parts and a little fun work. If you’ve got a busted up old Danlelectro, it’s a modification/custom job I’d highly recommend. You’ll have the only one on your block, and it’ll sound pretty darn good, too. Happy hod-rodding! I have an amp in case silver tone , complete and original. I hate the bridge and would like to install a bigsby tremolo. Any reason why not?